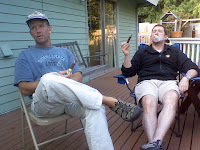 Unfortunately, this time an ordering snafu resulted in us not getting our selected cigar in time. They did arrive the day after the herf and will be carefully stored and enjoyed on the 10th of August at Herf #15. The five of us were treated to delicious homemade brews and salsas, crafted by Pat, as we relaxed and chatted out on his back deck. The slow-cooked chili he served up was fabulous and really hit the spot. Once everyone had their fill, it was time for the tasting session; which took on a different twist for us this time since the occasion was now a BYOC event. 89 and 89 given by Robert and Pat for the Don Pepin Garcia Blue Label Invictos (robusto), an excellent cigar. 86 given by Fernand for the Gurkha Estate Select Vintage Churchill, an excellent cigar. 93 given by John for the Rocky Patel Decade Torpedo, an outstanding cigar. 84 given by Joe for the Vegas Robaina Famoso (robusto), a very good cigar.